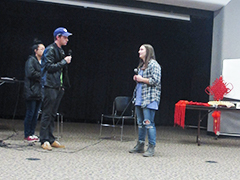 The Confucius Institute, in collaboration with the Chinese Language and Culture Club and the Chinese Language Program in the modern languages department, hosted the first Chinese Language Show, Dec. 2, 2016, in the K-State Union's Little Theatre. The event gave K-State students in the Chinese language classes an opportunity to showcase their Chinese speaking skills and to help attract more students to the Chinese Language Program classes. The show featured nine lively language skits created and performed by K-State's Chinese I and Chinese III students in the fall 2016 semester. Not surprisingly, many skits reflected college life, such as moving to a new city, meeting new friends, weekend plans and relationships, but the funny plots and humor students showed elicited much laughter from the audience. Even though the Chinese I students had not been studying the language for very long, the audience found their enthusiasm infectious. "The show created a valuable opportunity for students to practice their spoken Chinese outside the classroom as well as to further their understanding of the Chinese culture," said Li Yang, assistant professor of Chinese. "Students not only applied what they had learned in class to their speaking performances, but they also learned to work with their peers in the process. In addition, by performing in front of an audience, they increased their confidence in their Chinese skills."